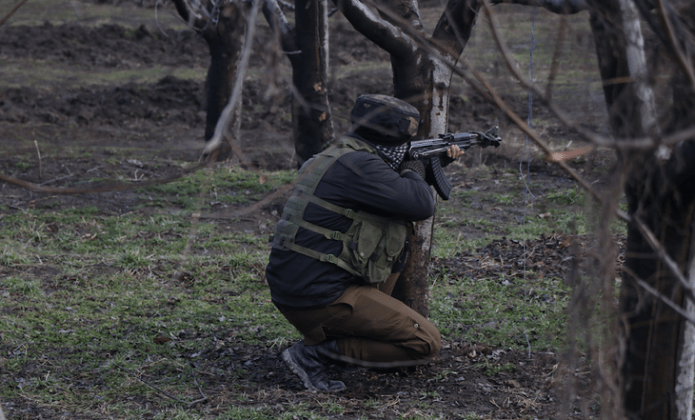 Srinagar, March 22: Two militants, of them a top commander of Lashker-eToiba, and a minor boy were killed during a gunfight in Hajin area of north Kashmir’s Bandipora district on Friday. Initial Reports said a joint team of Army’s 13RR, CRPF and SOG launched a cordon at Mir Mohalla of Hajin late in the afternoon yesterday. Both the militants were killed in the encounter, he said. The teenage boy who was taken “hostage” also died. He had said family and members of local Auqaf committee and a magistrate were brought to the encounter site to persuade the hiding militants to release the those “taken hostage by them”. While one of the two hostage, a minor girl, was evacuated by the joint team of government forces, minor boy identified as Atif Mir died. Official sources said that the house belong to Abdul Hamid Mir was razed to rubble and all the three bodied were charred. Police and army also recovered two Ak-47 rifles. Among the two militants killed, oe of them is said to be ‘Ali Bhai’, a top commander of LeT whoch was active in the area for several years. However, the identity and group affiliation of the slain militants was not official confirmed so far. Previous articleSix killed in explosion at chemical plant explosion in China. Next articleBritish PM at European Council summit in Brussels.